We haven't had much Comic Book news here as of late, maybe it's because I'm just trying to cut down on the reading and be lazier than usual. I've been having a hard time getting cool storylines to come out of the comic books I read or maybe I just read too much Deadpool and now it's starting to rot my brain. No matter how lazy I am, news about an ongoing Red Lantern Comic Book is really something I need to post. 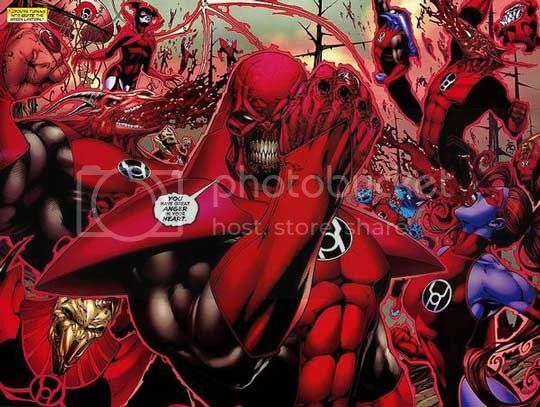 I don't think they'll crash with any of the Green Lanterns yet but just the thought of Atrocitus getting his rage groove on over and over again gives me the willies... whatever that means... Geoff Johns will be putting down his pen on this one and will let Peter Milligan do all the writing. To be honest I don't know who Peter is or the stuff he's written but I kind of like his plans for this book. Check out his thoughts after the break.